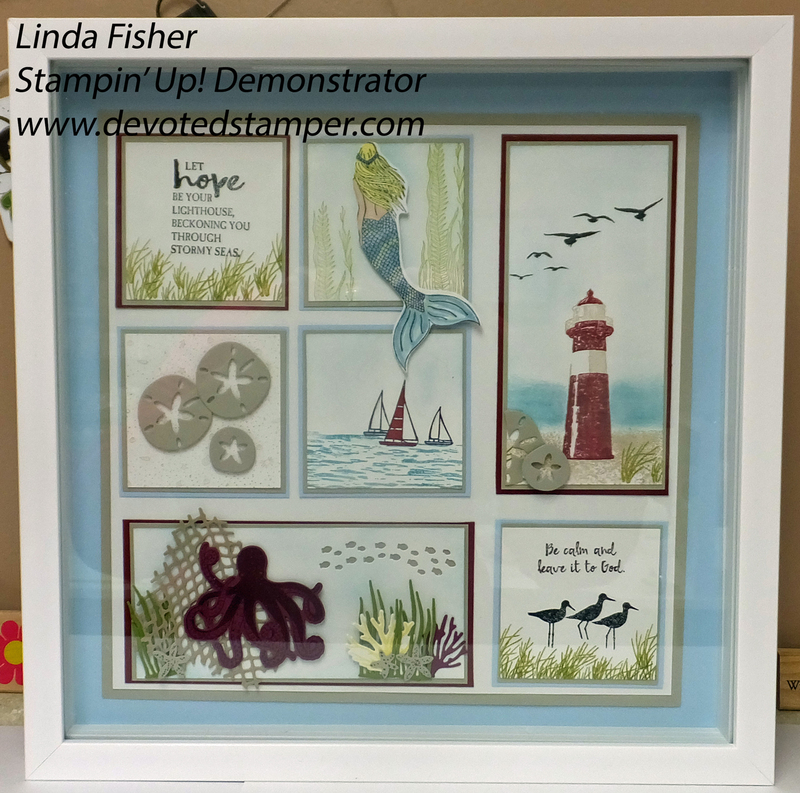 An acrylic block is inked with Pool Party and stamped directly on the Very Vanilla cardstock. So simple, yet elegant and beautiful. The base is an 8 1/2 x 5 1/2 piece of Soft Suede, scored at 4 1/4. The Pool Party layer is 5 1/4 x 4, and is adhered to the base with snail adhesive. The Very Vanilla layer is 5 x 3 3/4. The images are stamped with Pool Party, Tuxedo Memento Black, Crushed Curry, Old Olive, and Soft Suede ink. 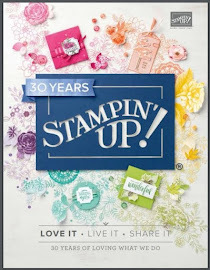 If you would like to place an order, head on over to my Stampin' Up! website Here, and click on the "shop now" tab, or click on the 2018-19 catalog right here on my blog. I do not consider myself a sponger, a spongee, though, at times, I do like sponging. I don't mean I like sponging off of my friends, I mean I like to sponge ink on cardstock. 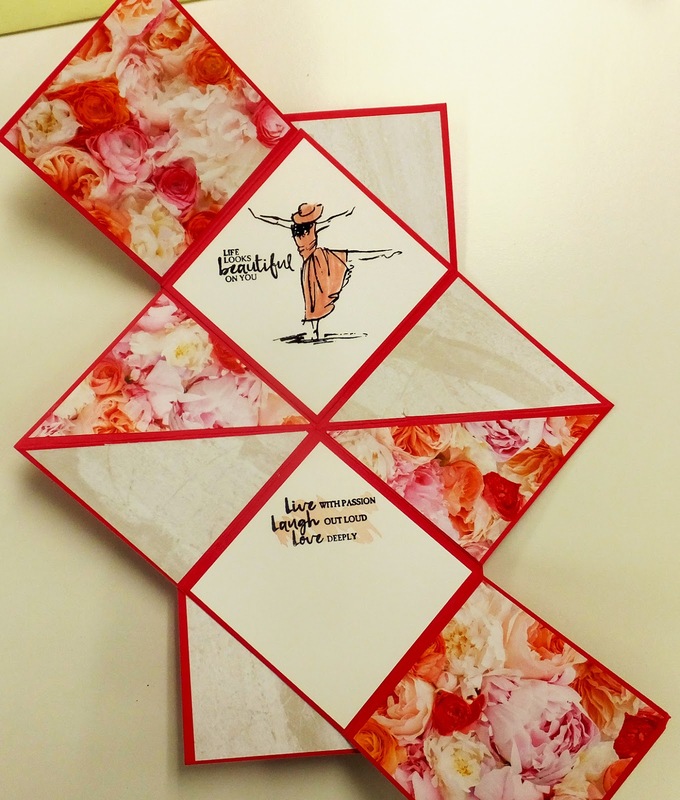 I saw Joyce Whitman's card on her blog, Here, post of 7/17/17. Joyce used glossy cardstock, and I decided to used the Shimmery White, because I like a little sparkle. The base is an 8 1/2 x 5 1/2 piece of Pear Pizzazz, scored at 4 1/4. The Early Espresso layer is 5 1/4 x 4, and adhered to the base with snail adhesive. The layer of Shimmery White is 5 x 3 3/4. I punched a 1 1/4" circle out of a 5 x 4 piece of scrap paper. Using temporary adhesive I glued the circle to the card front (to make a sun). I sponged the top third of the Shimmery White with Balmy Blue. The middle is sponged with Pear Pizzazz, and across the bottom, a really light layer of Soft Suede. Stamped my image and words with Stazon Black ink. I removed the 1 1/4" circle, and placed the scrap piece of paper you have from cutting out the circle on the card front. Sponged with Crushed Curry and filled it in to make the sun. I hope you like this beautiful and touching sympathy card. The base is an 8 1/2 x 5 1/2 piece of Blueberry Bushel scored at 4 1/4. The Blueberry Bushel DSP layer is 5 1/4 x 4. 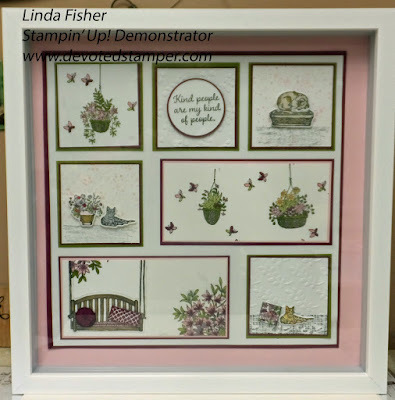 The Whisper White layer is 4 x 3 1/2 and stamped with images from Touches of Texture with Calypso Coral, Old Olive and Daffodil Delight inks, then sponged with some Blueberry Bushel ink and a stamping sponge. The Vellum cardstock is 4 x 3 1/2. 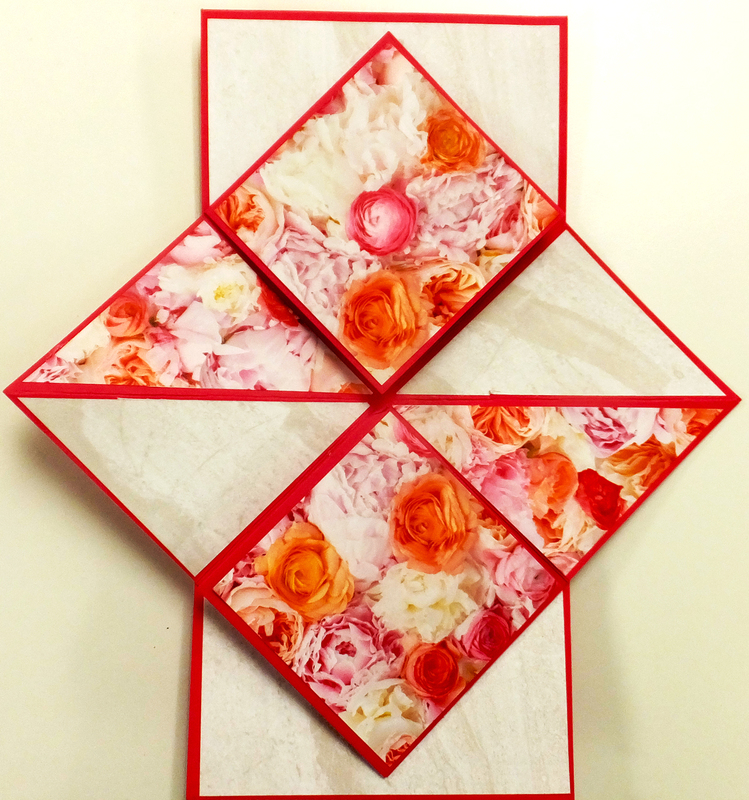 The two dies are cut from the Rose Trellis Thinlits with Whisper White cardstock. 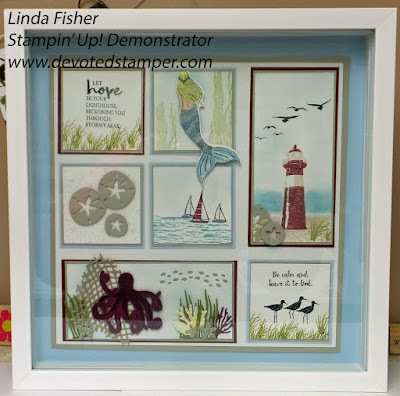 The words from Well Said are stamped with Blueberry Bushel ink, and the die cut is sponged with the same ink. The ribbon is some Calypso Coral Satin Ribbon from P. 25 of the Occasions Mini. All done, and remember to decorate your envelope. Should you want to order any of the supplies I used to make this card, please click Right Here to place your order in my on-line store. Or, you can click on the 2018-19 catalog right here on my blog. I hold adult classes in my home at 555 Williamsdale Road, Graham, NC 27253, and if you would like to attend, please let me know. 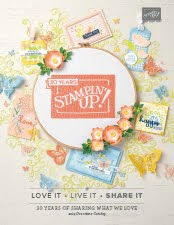 For details, see my class schedule right here on my blog, or on my Stampin' Up! website found Here. 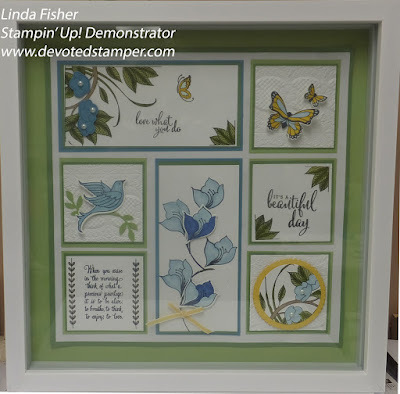 This beautiful card was offered at one of the Shoe Box Swaps in which I participated, and was offered by Retha Fulp, one of my very talented downline, and a wonderful friend. The base is an 8 1/2 x 5 1/2 piece of Grapefruit Grove scored at 4 1/4. The Soft Suede layer is 5 1/4 x 4. The 5 x 3 3/4 layer of Whisper White layer is sponged with Grapefruit Grove ink. The 5 x 1 3/4 piece of Soft Suede on the front is dry embossed with Seaside Embossing Folder. The jars are cut with the Everyday Jars Dies and Whisper White cardstock, and Vellum cardstock. Bakers Twine is wrapped around one of the jars. Add some sponging and a doily. For all the details about this class, please visit my class schedule Here. This is one of the cards I offered at my March, 2019 Creative Fold classes. I used the Beautiful You stamp set, and the best news, this set will be carried over to the new 2019-20 SU catalog. Yeah!!! You can also use this card as a mini photo album too. If you would like to make one of your own, you Amey Daniels on YouTube Here. She has a fantastic video. I did change the colors and the stamp set, you know, to make it my own. I used my Envelope Punch Board to make the envelope for the finished card size of 5 1/2 square. Should you want to order any of the supplies I used to make this card, please click Right Here to place your order in my on-line store. Or, you can click on the 2018-19 catalog right here on my blog. I truly appreciate your support. Please do not hesitate to contact me with any questions you may have, as I am here to help you. I started this card by stamping the flowers from Tea Together with Tuxedo Memento Black ink. 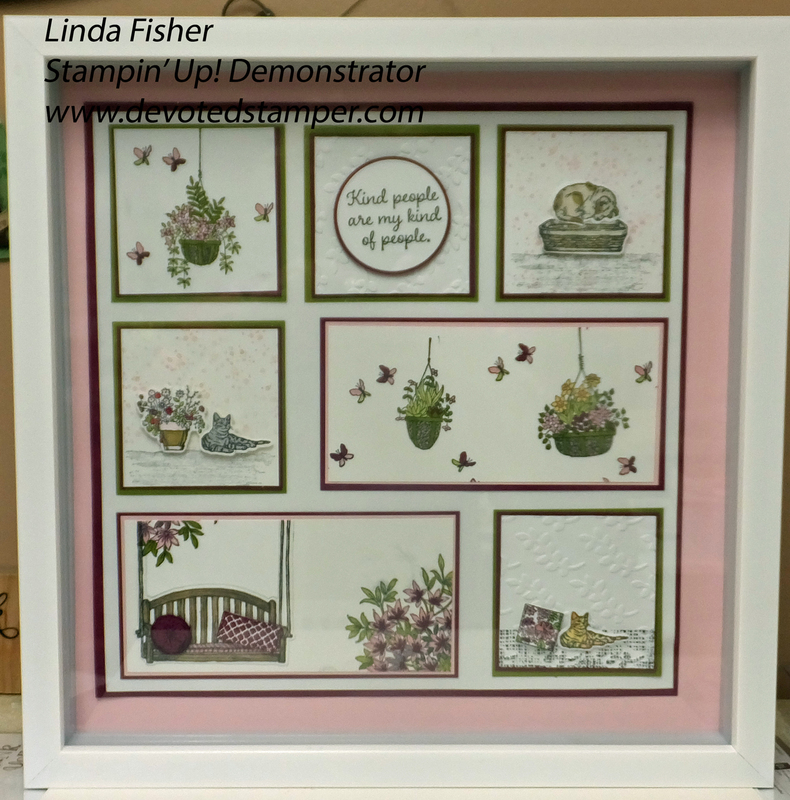 Then I colored the flowers with Stampin' Blends. My sweet friend, Wendie Jamison actually finished the card for me, and might I add, did a fantastic job. 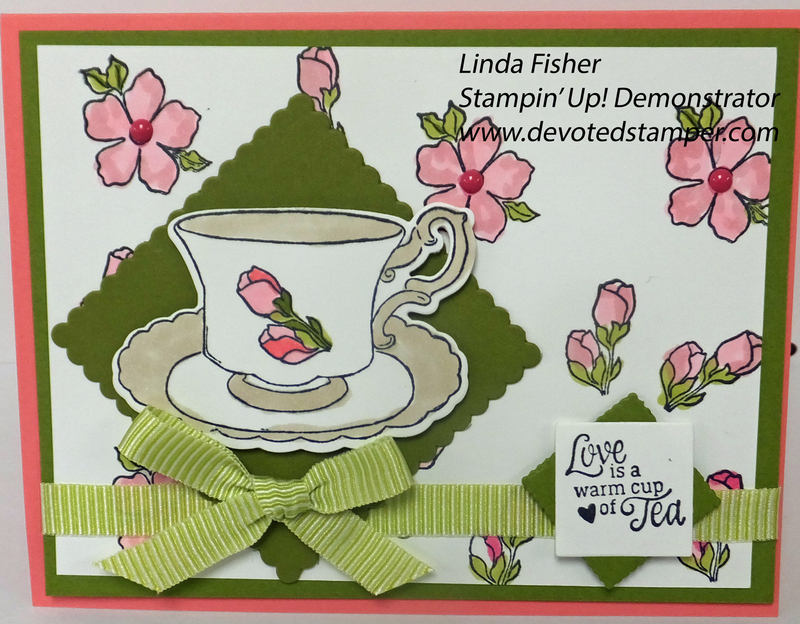 You can find the Tea Together set of 9 stamps on page 49 of the Occasions Mini. The base is an 8 1/2 x 5 1/2 piece of Flirty Flamingo, scored at 4 1/4. The Old Olive layer is 5 1/4 x 4. The Whisper White is 5 x 3 3/4. 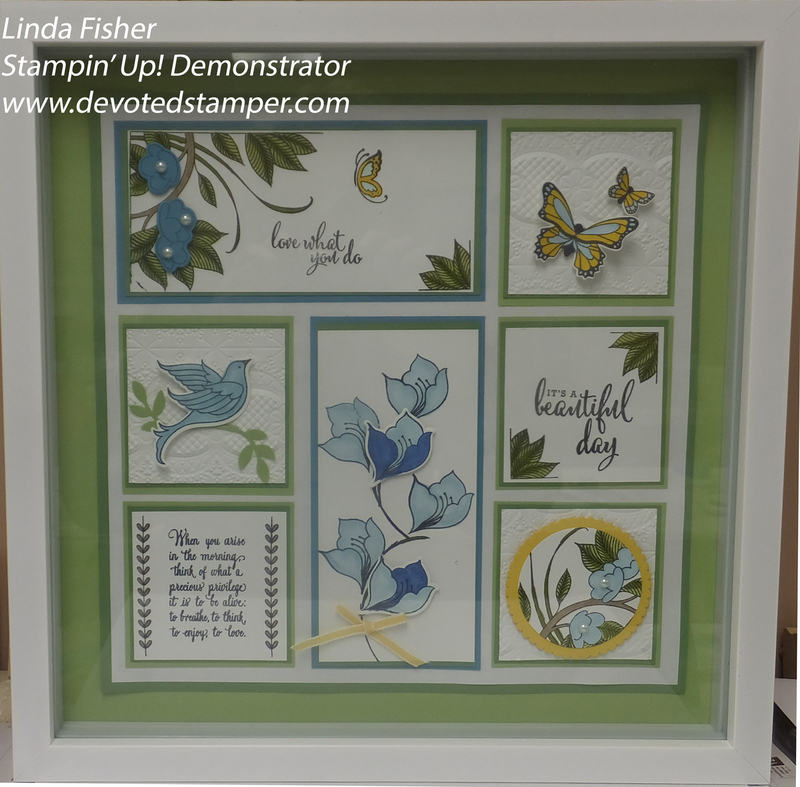 The 2 1/2" Scalloped Square is cut from the Layering Squares dies. The cup is stamped with Tuxedo Black ink on Whisper White and cut out with the Tea Time Framelits Dies. The dots in the middle of the flowers are made by coloring Basic Pearls with a Sharpie.